Thank you every one for coming along to the Council meeting tonight and for writing and emailing Councillors. We had about 26 people there. 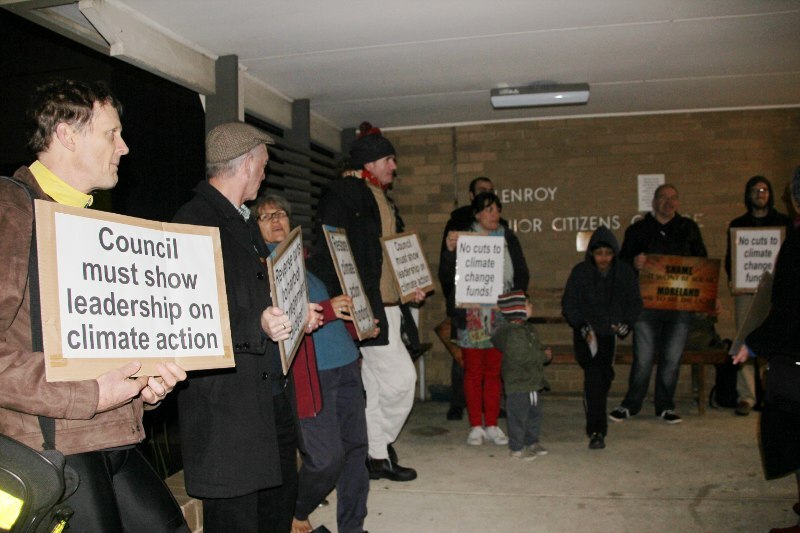 I thought the protest was a worthwhile statement to Council. Did we achieve what we wanted? In practice yes – the 3 solar PV projects the money was allocated for will all proceed through the tender process, where as that wasn’t guaranteed before tonight. But we didn’t get a reversal of the original decision. So Council is committed to these projects and will do any necessary budget adjustment at midyear budget review after the tender process is finished. A face-saving compromise, but one that ensures in practice Council’s continuing commitment to climate mitigation. 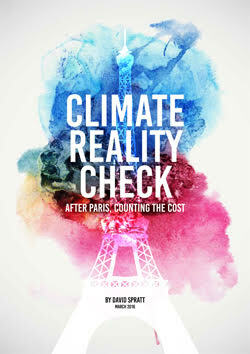 This is a substantial win on maintaining Moreland Council’s commitment and leadership on climate mitigation. 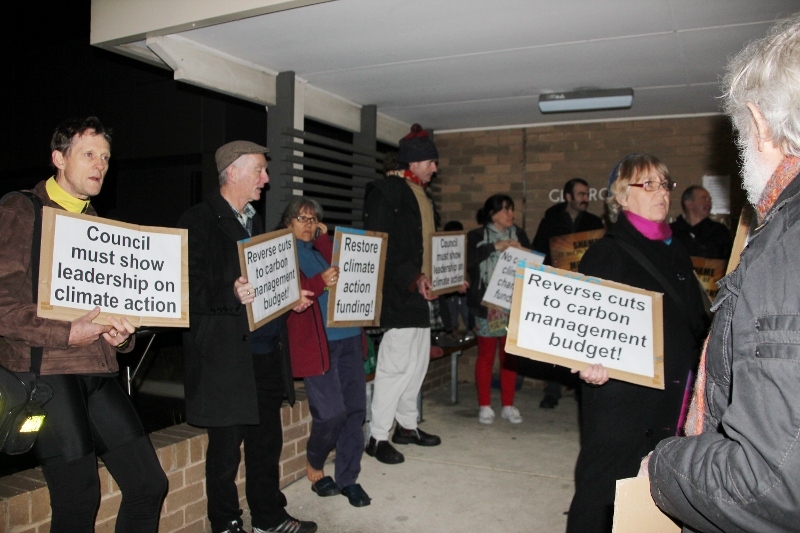 The Empowering Moreland Forum on 7th August passed a motion without dissent for a protest at the next Moreland Council meeting to persuade Councillors to fully restore funding to the Carbon management Strategy. 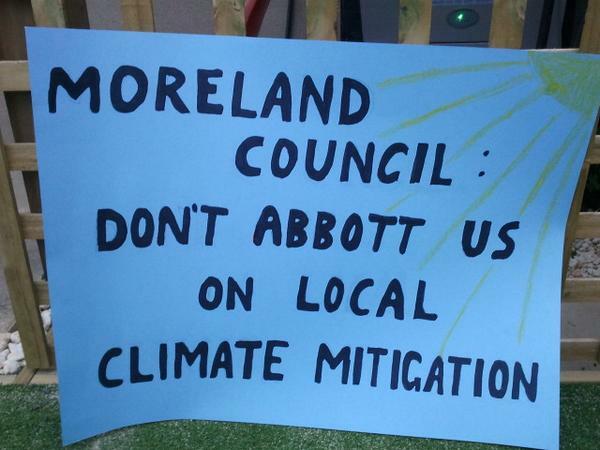 See Climate Action Moreland Statement in reply to the decision made at the 9th July Council meeting. 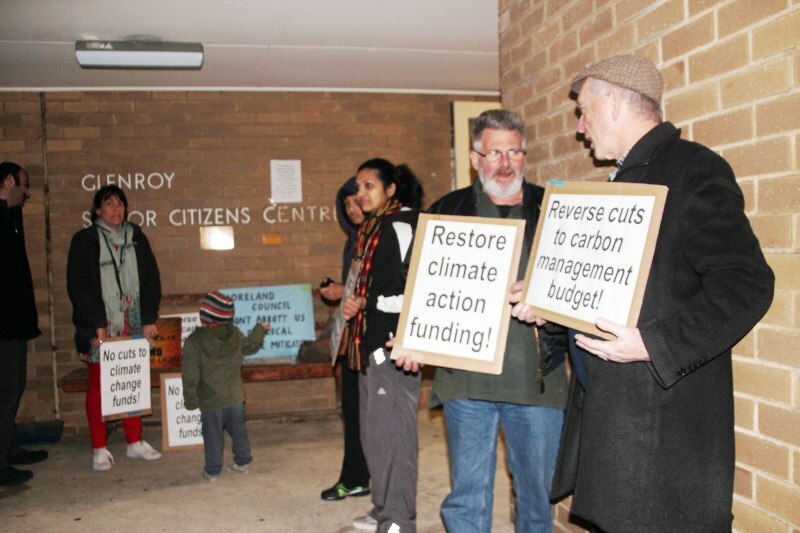 Moreland City Council began its Carbon Management Strategy in 2011. This involves energy efficiency works at Coburg Civic Centre, Coburg Leisure Centre, Fawkner Leisure Centre, Bob Hawke Centre and Walter Street Depot. 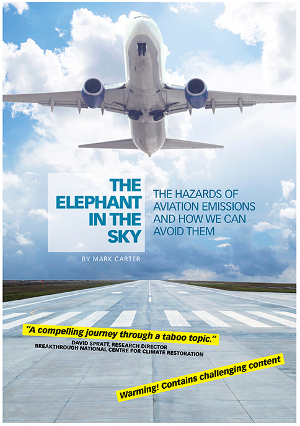 The Strategy has resulted in savings of 802 tonnes CO2-e per year and $102,083 per year. The draft Moreland City Council budget for 2014/15 allocated $525,000 for these activities. In July 2014, Cr Michael Teti moved to cut these funds by $100,000. This motion passed with the support of Crs L Tapinos, O Yildiz, M Hopper, & L Gillies. The motion was opposed by Crs R Thompson, L Thompson, S Bolton, S Ratnam, & H Davidson. 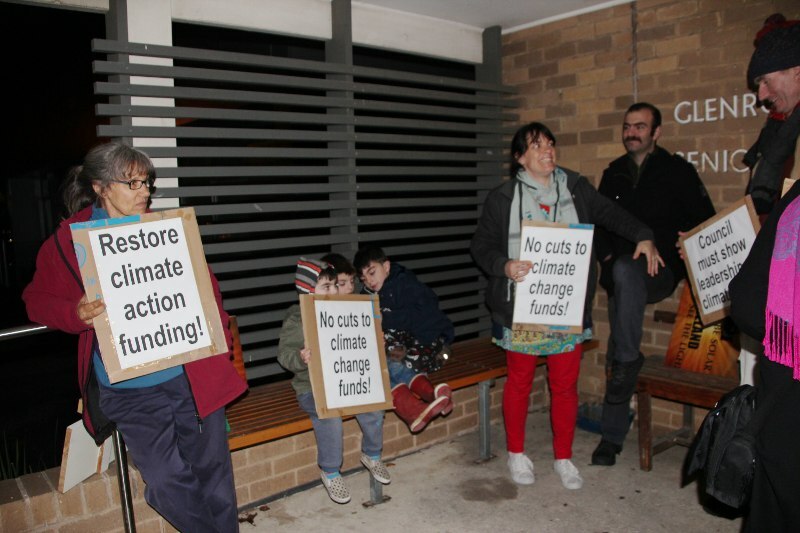 The funding cut would result in the planned solar power system for Coburg Leisure Centre NOT proceeding. DON’T LET THIS HAPPEN. TAKE ACTION NOW. Entry filed under: Event, Moreland Council, rallies & protests. 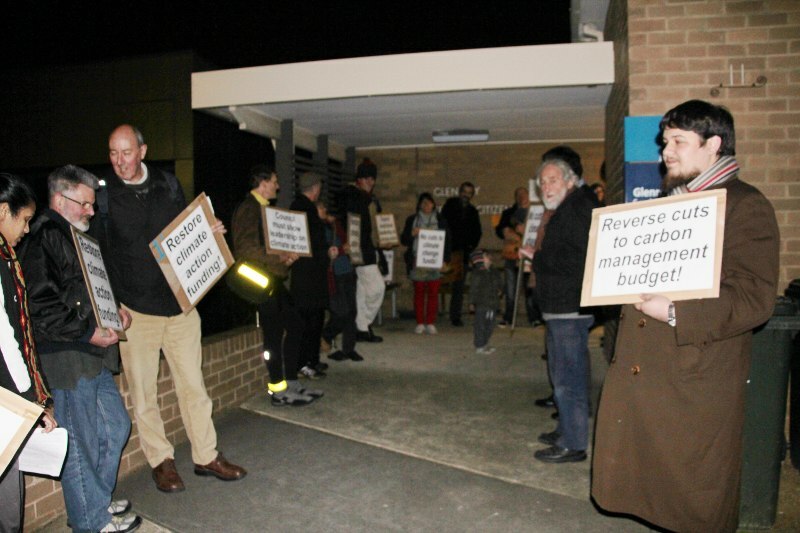 Tags: Moreland Council, Protest.